I quickly just wanted to share some more lovely photos of my favorite model wearing her hair fashions. Above, was the first Large Fleur we did because my Daughter absolutely loved the red and white pattern and I do like to oblige her requests on occasion (all the time). It was perfect for the Fourth of July! Each year, we make a Calendar for our closest Family Members. This was a quick little impromptu photo shoot I did with the kids. For a girl that hates to have her picture taken, I do on occasion get a great shot of her! Fabulous! This time around, I do plan to incorporate more photos of my little one wearing her bows and I do hope you all enjoy them and that it helps to see the bows on a girl of small stature to better know size and proportion. There is a method to my madness most of the time, most of the time. Please give some feedback, do you like some of the changes? Is there something you would like to see more of? Ideas to coordinate with an outfit? 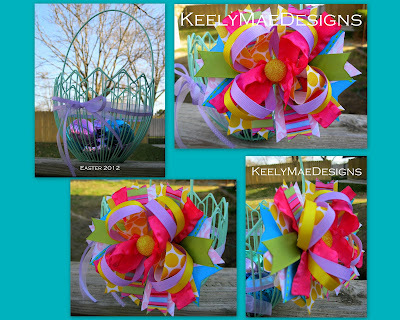 I am open to new ideas too, send them to KeelyMaeDesigns@gmail.com. My bow skills are wide, please pick my brain! As some of you may have known, I had to temporarily shut down this blog. Today, I am happy to announce our coming back!! Our little family has survived a tough time with layoff, but finally now that my Husband once again has a full-time job, I can now also resume my hobby. Thank you all for your kind words and understanding. I too now have kept my promise of resuming hair clips, bows and other beautiful hair accessories. With that said, this time around, I won't make a bunch of bows, flowers, clips, bands or facinators for selling. I will post pictures of what I made of my daughter and if you see anything that catches your eye or if you simply just have a request, please e-mail me at KeelyMaeDesigns@gmail.com. I will do this in the beginning just to feel things out and see what is popular rather than doing everything. Ok, thank you everyone and I hope to hear from you soon! Now for pictures of some of the new things I have worked on for my daughter's Fall/Winter wardrobe. Above my lovely daughter is modeling, the Large Fleur in Burnt Orange with a stunning jewel in the center! 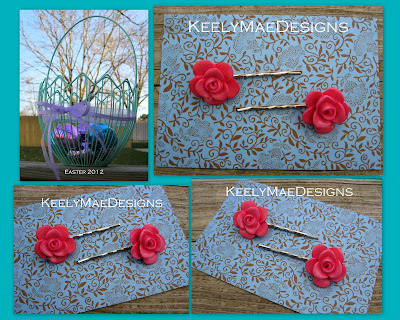 This stunning flower can either be attached with an alligator clip or a bobby pin, by request. My favorite color yet, Large Fleur in Autumn Gold. By request, alligator clip or bobby pin. Large Fleur in Purple Plum also with a stunning light catching jewel in the center. My daughter receives many compliments with these flowers. Also by request, alligator clip or bobby pin. Large Fleur in Red/White Pattern. Triple Stack Hair Bow, Fun with Leopard. This is a style that I have noticed is quickly becoming popular. My daughter has received the most compliments on this bow. It catches the eye of every Grandma, Mom and Teacher that walk by and is also a favorite of my Daughter's. By request, alligator clip or french barrette. This is a fun Christmas hair bow I made to go with a grey sequin Christmas dress that we selected for my daughter in our Family Pictures. The bow really shined in our family photos! Its extra fun topped with Ostrich Feathers and two jingle bells. My daughter loves to shake her head to make them jingle. It is sure to dress up the holiday and add some cheer to the Holiday festivities. Hope everyone enjoys these as much as we have and I hope to receive many requests soon! Thank you for returning and keep checking in, as I have a couple more projects on my desk that I am working on. Head over to the FB Page, Keely Mae Designs, to see more designs that I just added and custom orders that have been fulfilled. 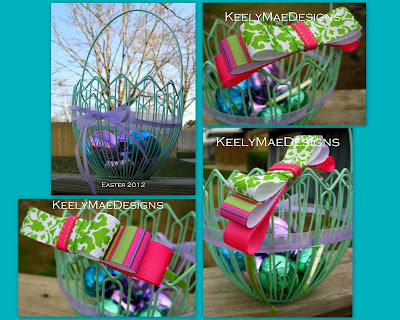 Have any questions or requests, e-mail me at KeelyMaeDesigns@gmail.com. Hurry, last week to order for delivery before Easter! Yes, it's almost that time of year! Spring has sprung and what better way to celebrate it than by wearing bright and vibrant colors in your hair. For this season, I decided to change up the line-up a bit and add more flair to the mix. There are still a lot of projects on my crafting desk, so I will add the designs to this post as they are completed. Keep checking back here to see the new designs as they are added. First is our signature Over-The-Top Boutique Hair Bow. 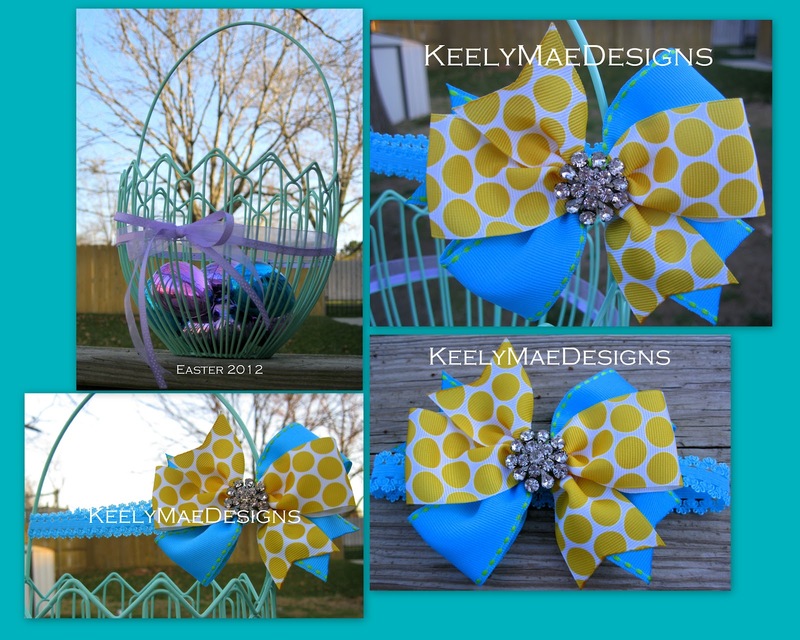 This bow is sure to match any Easter or Spring outfit for your little girl. 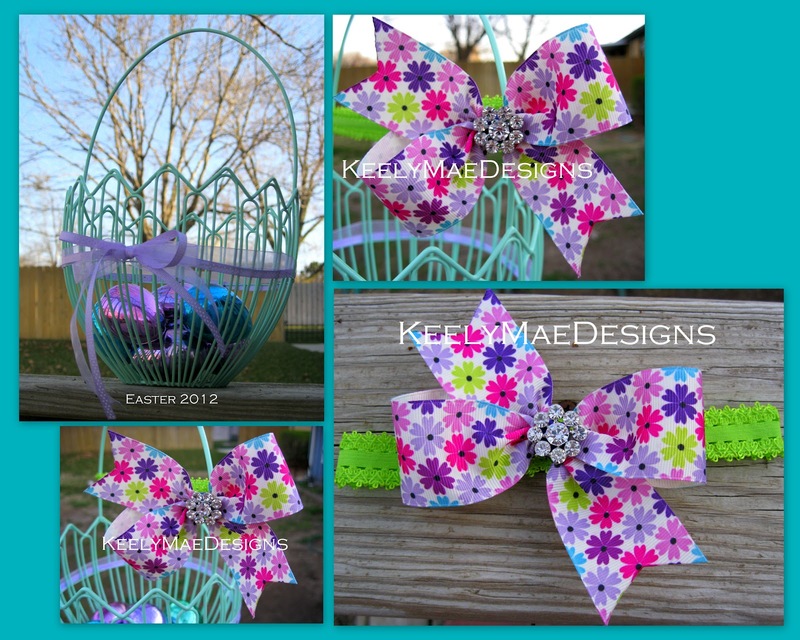 Our Easter/Spring bow will be up for grabs in a GIVEAWAY over on Making of a Mom, you can check them out ahead of time and be sure not to miss the giveaway, a $12.00 value for FREE! 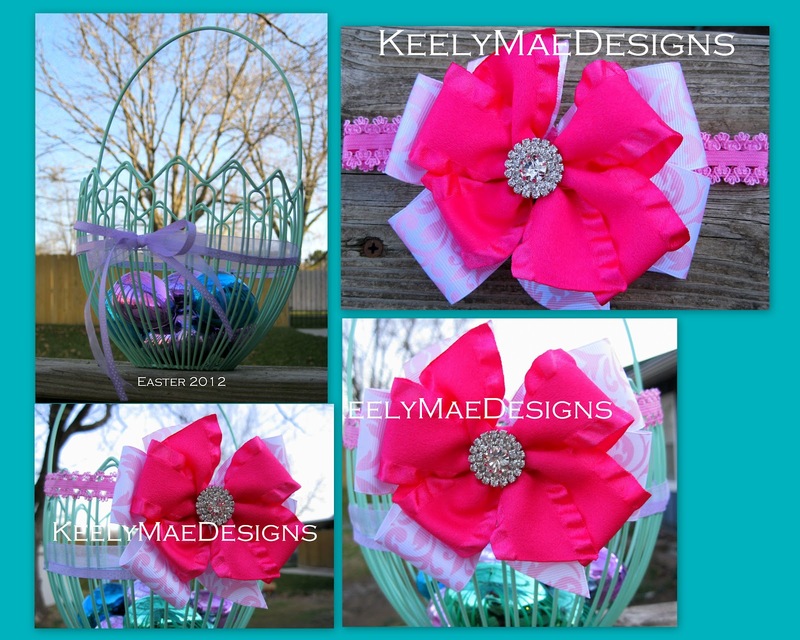 The Pinwheel Boutique Hair Bow is in every girl's essential color, pink! Also features a Damask Pink/White print and topped with just the right amount of sparkle for any Princess. 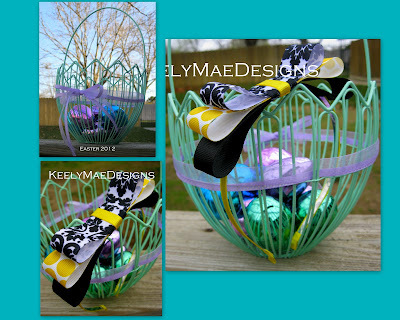 This bow is also on a clip which makes it convenient to clip to any headband of your choice. Headband pictured can be available by request. Bow Tie Hair Clips are another essential and these are available in every Easter/Spring Color to coordinate with any girl's wardrobe this season. The felt flowers are making a reappearance from last year's Spring, but with a new and fresh twist! These are for those girls that like just a little fancy flair. 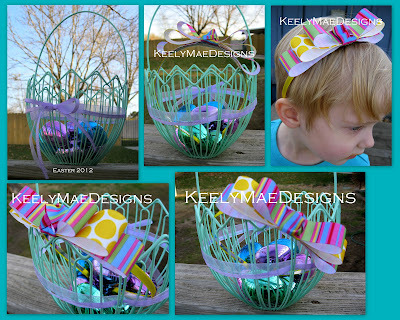 Layered Bow Headband, features bright Spring colors. Headband is lined in a satin bright yellow ribbon. 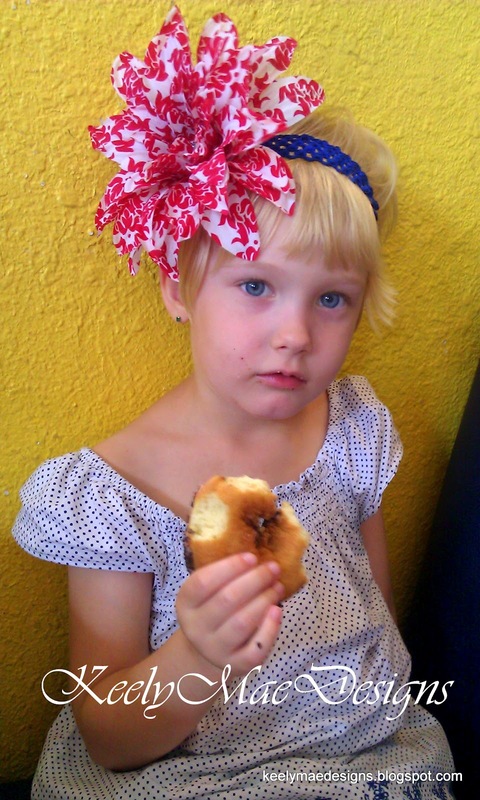 I've heard your requests and have added headbands to the mix for the older girls and girls with short hair(such as my daughter currently). 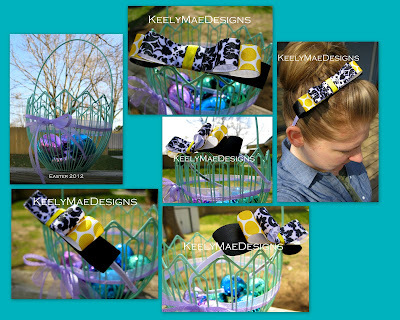 I have several more headbands in the works and will have them added soon! How adorable is this Layered Bow Headband? And what better way to show how cute it is than my own daughter modeling it for you. This is truly one of her favorite designs, she wears it all day and I am certain it will delight your little princess too. The second add of the Layered Bow Headband features a green/white Damask Print mixed with lavender purple and green polka dots. It has a charming quality that will accessorize any girl's wardrobe. Headband is lined with a satin light green ribbon. 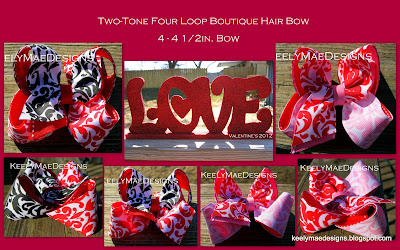 Layered Two Loop Pinwheel Bow Headband has a sophisticated quality with a black/white Damask Print paired with a contrast of hot pink(my personal favorite design, don't be surprised if you see me wearing this one myself). Topped with a sparkling jewel, it's sure to please the Rock Star in all of us. A fabulous petite Layered Two Loop Pinwheel bow if I do say so myself with a touch of bling. It may be petite, but the blend of colors makes for an impact! 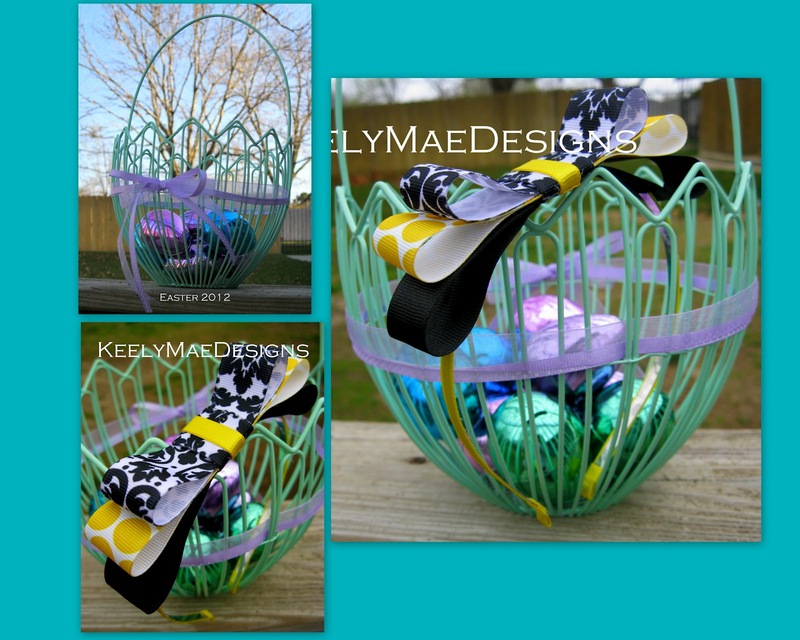 The perfect go to bow for Spring. Stretchy headband available upon request. 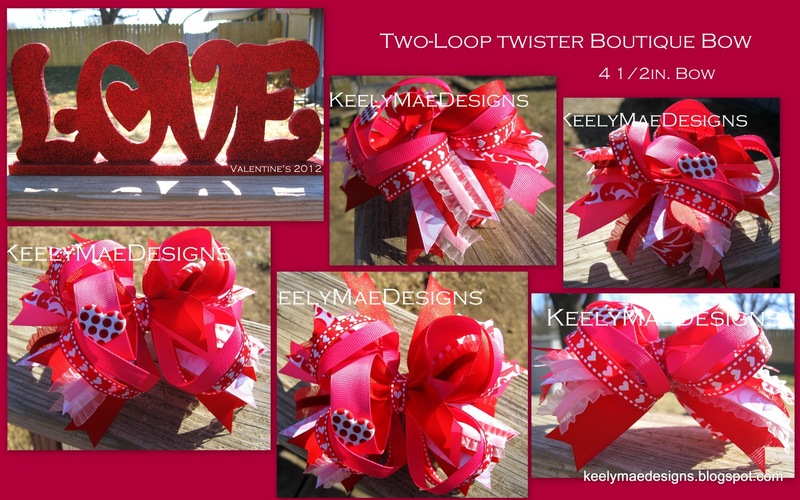 The Two Loop Pinwheel Bow is another beauty with sparkle. This is a modern take on an old classic and simply stunning. Sure to accentuate any special outfit this Spring. Stretchy Headband available upon request. Is there anything better than the crisp contrast of black, white and yellow? A color combination I have loved for some time now and finally made a Layered Bow Headband to appease the need for such. I just love the Damask prints that are so popular right now and how easily the print can be paired with other prints for a simply elegant sophistication. Oh and yes, that is no other than I modeling it for you because this headband is not only cute for a little girl, but can also quickly dress up an otherwise bad hair day for us ladies. This headband, as you can see, has quickly become a personal favorite and hopefully it will be your's also. Wear it to dress up a casual outfit or with a dress, sure to compliment any outfit! I have noticed this Spring's and Summer's fashions this year are all about that Nautical look. I personally have been a fan of Americana Fashions for most of my life and was excited to see the new Spring/Summer Fashion trends! I created this headband to compliment the Nautical outfits with a touch of sparkle, for the little ones, although it too can be for us ladies! Anchors Away!! Vintage inspired Rosette Hair Pins, perfect for a simple touch. I attached felt to the back of each acrylic rosette to insure a smooth surface that won't pull on the hair. These are sold as a pair, but upon request, may purchase one. Owls are usually thought of as Fall/Winter, but if you are like me, you can always appreciate an adorable Owl. Our Owl Hair Bow features a cute Owl Adornment with Spring colors. 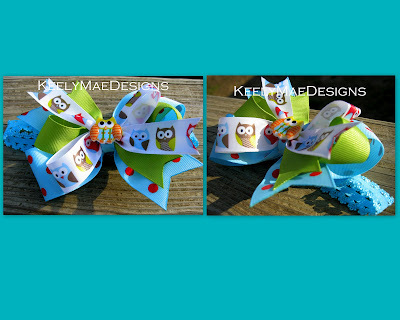 If you are a fan of Owls, this is the hair bow for your little one! Stretchy headband available upon request. 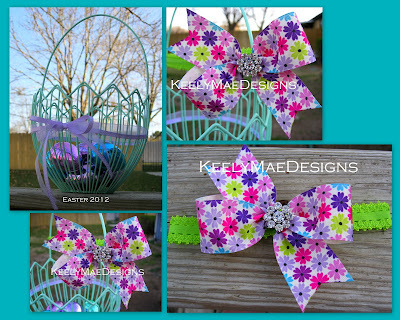 All Hair Bows are Hand Stitched for Durability and Handmade at time of Purchase. 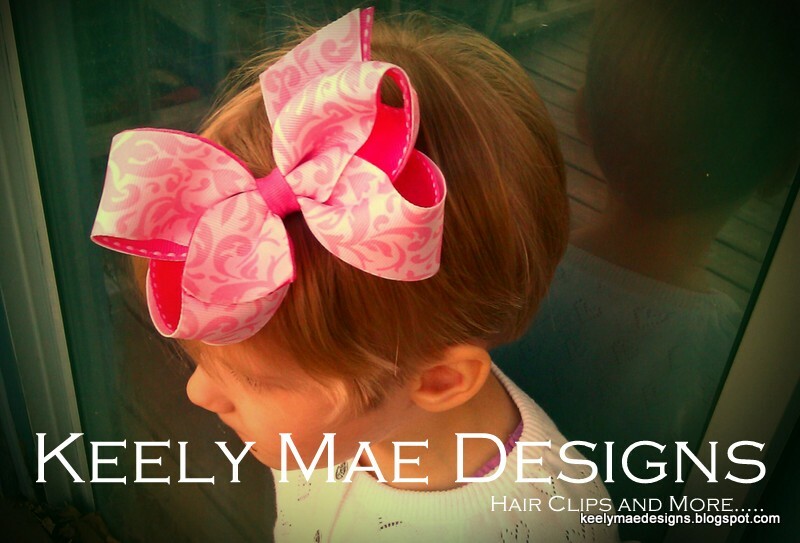 Other clips, barrettes, pony-o's and headbands are available upon request. 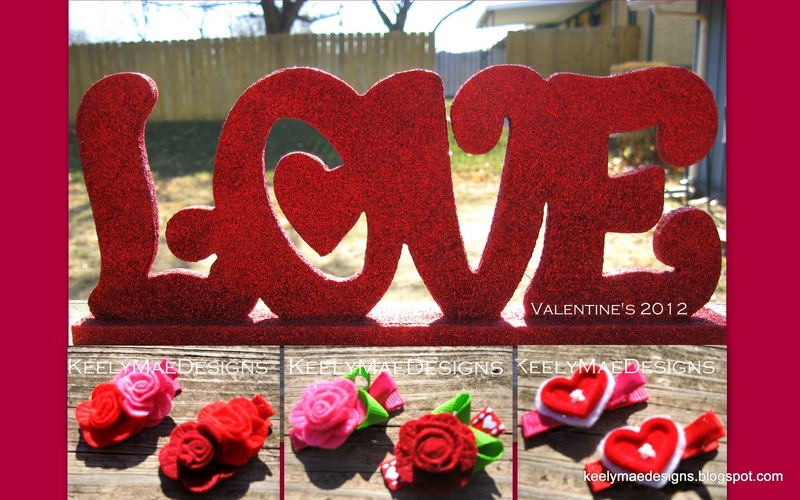 Have questions, a request or wish to make a purchase, e-mail me at KeelyMaeDesigns@gmail.com. We accept Paypal! Fresh new designs!! 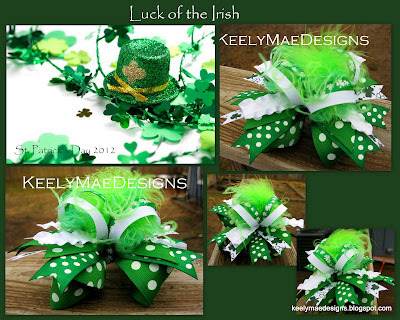 Now that Valentine's has come and gone, it's time to start looking to St. Patrick's Day and here are a few design ideas I have to share with you. 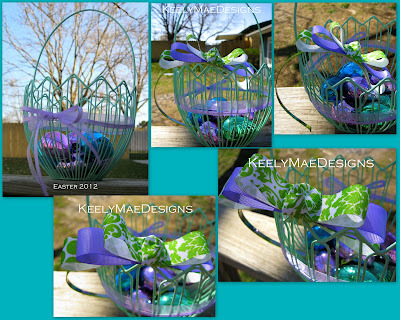 See anything you want to request or purchase, e-mail me at KeelyMaeDesigns@gmail.com. If you have trouble viewing any of the pictures in the post, click on the picture and it will take you to a larger picture on another page. Not done viewing?? Click the back arrow and it will bring you back to this page. 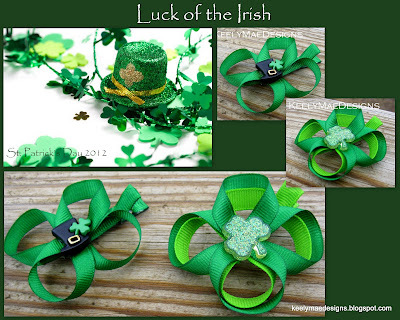 First, is our Shamrock Hair Clips. 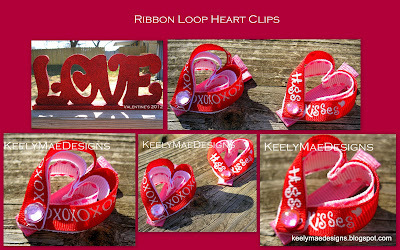 These are made of grosgrain ribbon and are on a lined alligator clip(1 3/4"). Wear one of these and they are sure to bring you the Luck of the Irish! Next I have a Petite Boutique Hair Bow and a Pinwheel Style Hair Bow. 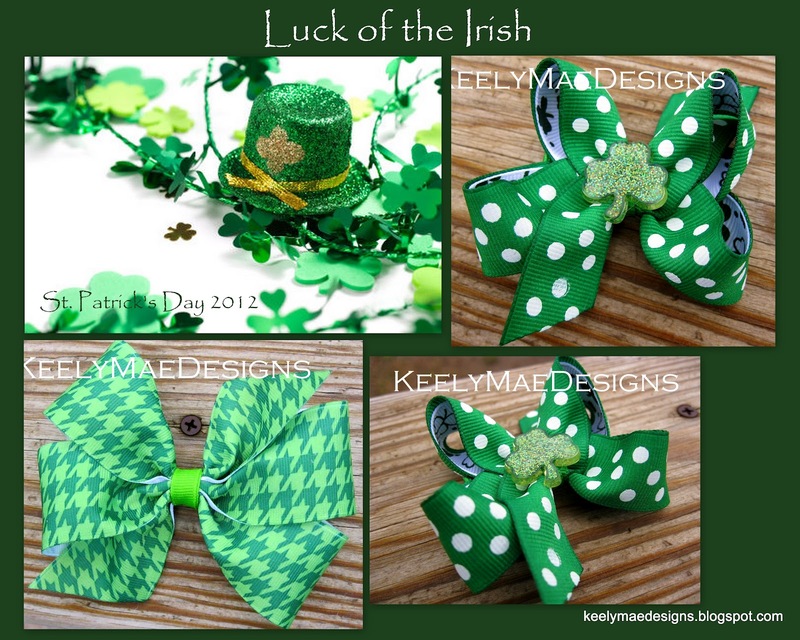 Each bow is made with grosgrain ribbon and full of cute little details, in a true Kelly Green color for St. Patrick's Day. 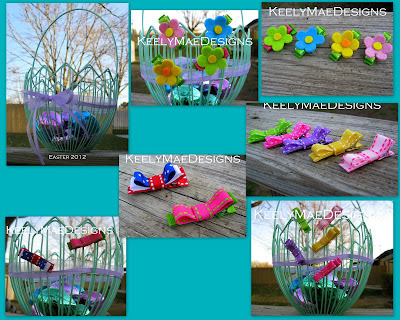 All the style of boutique hair bows, but in a petite size. Finally, what would Keely Mae Designs be without the Over-The-Top Hair Bow? Made with grosgrain ribbon and topped with an Ostrich Feather, this one is sure to be the envy of your friends! 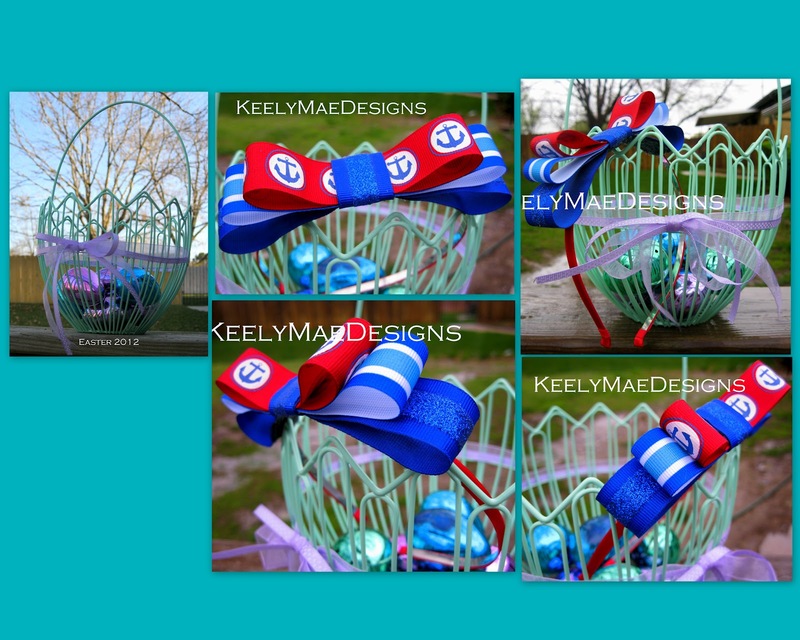 All the above bows are hand stitched for durability and are on a lined alligator(1 3/4in.)clip. Other clips and barrettes are available upon request. Wish you Luck of the Irish on this St. Patrick's Day! 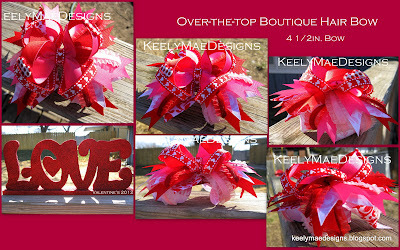 For Valentine's, I have three kinds of Hair Bows, from simple to over the top! First is our simple Sweet Heart Four-Loop bow in a beautiful pink Fleur-De-Lis print. 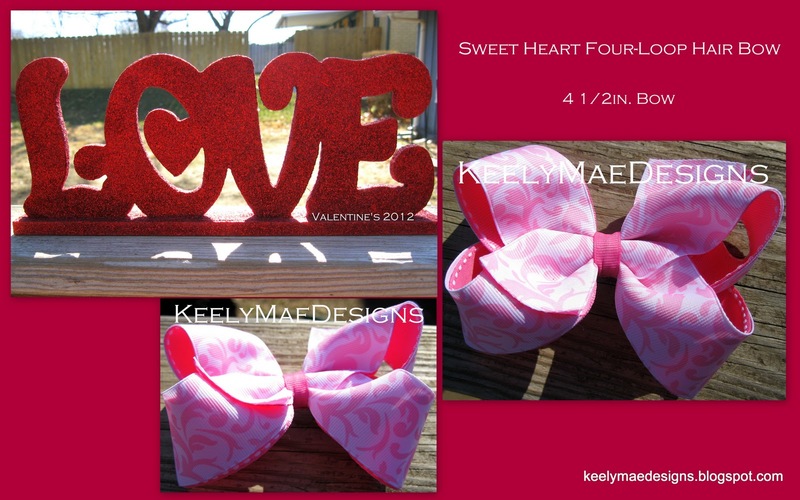 This bow can be made into any size per request. This Two-Loop Twister Bow, has an intricate design. 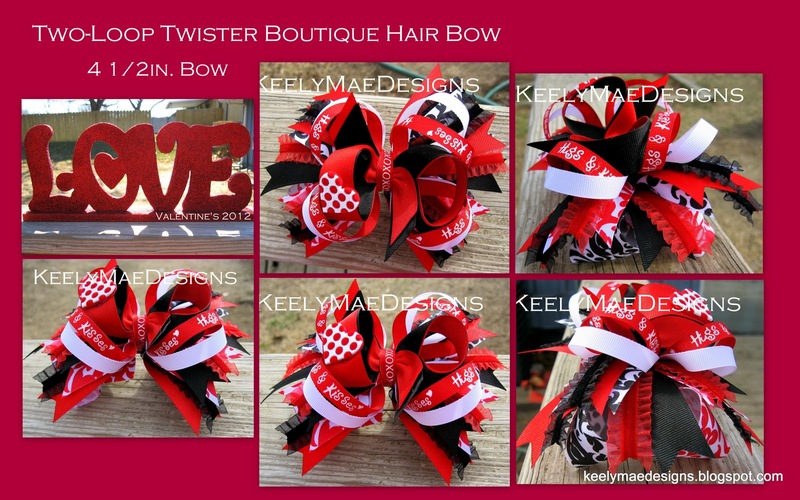 The base bow is a Four-Loop Twister bow with the pink Fleur-De-Lis print from the bow above and also incorporates a red Fleur-De-Lis print. There are several layers of shockers to add depth and then topped with the Two-Loop Twister bow with a heart accent. It is a must see from all views! Finally, for those who have a love for over the top drama, we have our Over-The-Top Boutique Hair Bow that has all the elements of the bow above, but with more details! This bow is truly an eye catcher! 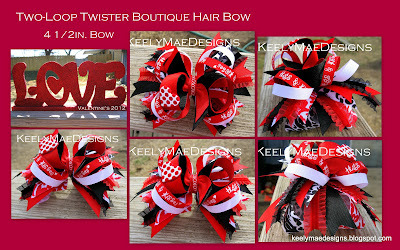 And for those that prefer the contrast of red and black for Valentine's, I have another Two-Loop Twister Hair Bow in red and black Fleur-De-Lis print with all the details and depth of the red and pink hair bows. 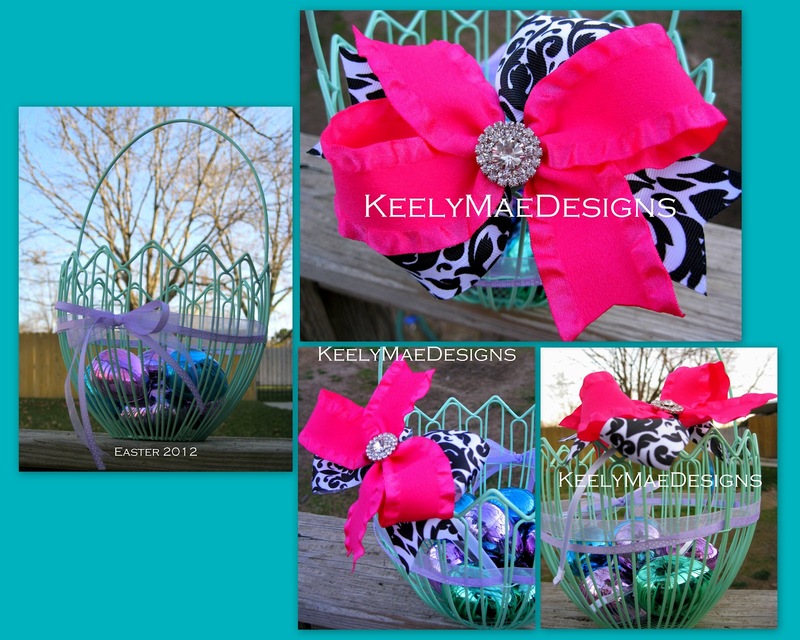 This bow is sure to be noticed by those little sophisticated beauties. 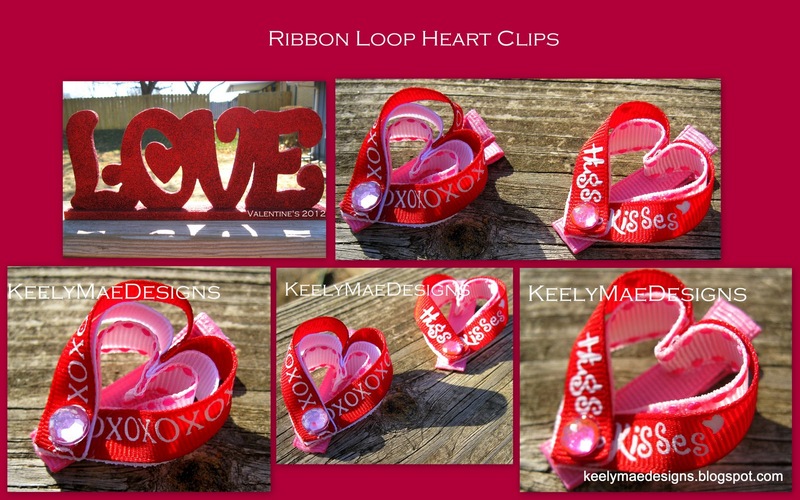 This rounds out the Valentine's Hair Bows. These Two-Tone Four Loop Hair Bows may seem simplistic in their design, but they incorporate two color patterns for a very intricate hair bow. These are simply stunning and will compliment any Valentine's outfit that your little cutie will be wearing. All the above bows are hand stitched for durability and are on a lined alligator clip. Other clips are available by request. This year's Valentine's hair clips are all about details with the fine materials of velvet hearts, felt rosettes and grosgrain ribbon. All are on a lined alligator clip(1 3/4in. )of vibrant pinks and reds to help bring color for your Valentine's Parties or just to add some color to your Winter Wardrobe. 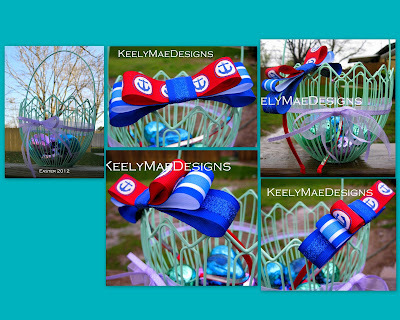 If you like Keely Mae Designs, you can check us out on Facebook and "Like" us there too. Add to any hair clip for $.25. Great for those girls with fine to very fine hair to keep from slipping.